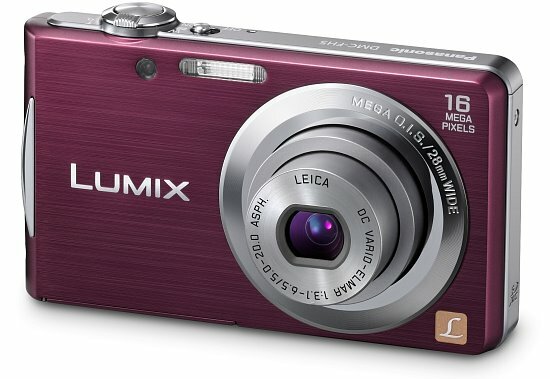 The Panasonic Lumix FH5 is a high-quality ultra-compact digicam. With good performance, excellent image quality and a price tag under $150, this is a camera worth considering if you are on a budget. Read more in our Full Conclusion. 2011 is a promising year for fans of Panasonic's LUMIX FH-series of point-and-shoot digital cameras, which will see performance upgrades as well as 20% slimmer profiles than their predecessors. The 16.1-megapixel ultra-compact LUMIX DCM-FH5 features a newly-developed retractable 28mm wide-angle LEICA DC lens with a 4x optical zoom (increased to 5x with the Intelligent Zoom feature), as well as the newly-incorporated Venus Engine VI (it elevates resolution, zooming capabilities, start-up speed, and auto focusing). Like all cameras in Panasonic's LUMIX series, the FH5 features their popular iA (Intelligent Auto) mode. New to this model year are Intelligent Exposure (prevents blocked shadows and blown highlights), and AF Tracking (for following moving subjects). Remaining features include Intelligent ISO Control, Face Detection, MEGA OIS (Optical Image Stabilization), and Intelligent Scene Selector. Another nice feature is the ability to - directly from the camera when it is connected to a PC - upload images to Facebook and videos to YouTube. Panasonic's LUMIX DCM-FH5 is available in a metallic, noble hairline finish (silver, black, violet, and gold), with a MSRP of $149.99 US.